Yes, I’m starting out a blog post with something I wrote a few months ago on the Big Fuel Content To Commerce Blog. 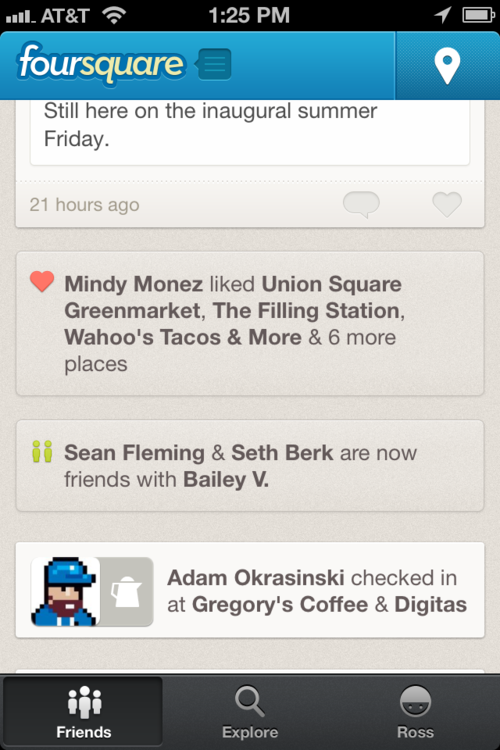 It might be self-serving, but I’m especially satisfied after last week’s launch of the new Foursquare app. The new emphasis on local discovery shows that Foursquare is on the right path to success and that they understand the shift in human behavior regarding recommendations via mobile technologies. Foursquare is clearly working hard to solve the “problem” I outlined in the above-linked piece with their new “Explore” features. Though Foursquare revealed last month that it has big changes in mind for its merchant platform, none of them appear in the new app. Eventually, merchants will have an option to purchase promoted placement of specials, and the offers will be targeted using the same technology that powers the Explore feature. A Foursquare spokesperson told Mashable that the company will begin rolling out the first versions of the option later this summer. We’re winding down our partner badging program, instead allocating those same engineering resources towards building out new merchant tools (that your brand will most definitely benefit from). As such, we’re unable to engage in new partner badge programs like this. If Foursquare continues to grow its user base, it should become the best way to connect with customers on a local level, bridging the gap between mobile/social and brick & mortar. Pretty soon, Foursquare will be another important platform for brands to consider when allocating paid media budgets, especially brands with retail stores. In you’re looking for further reading about the “new” Foursquare, the NY Times wrote a piece about the future growth potential of the platform and Tech Crunch snagged the first interview with Foursquare co-founder Dennis Crowley after the launch. Loving the new app, but why are the “friends who have been here” icons so small and not hyperlinked?! You can now “like” places, comments and tips. 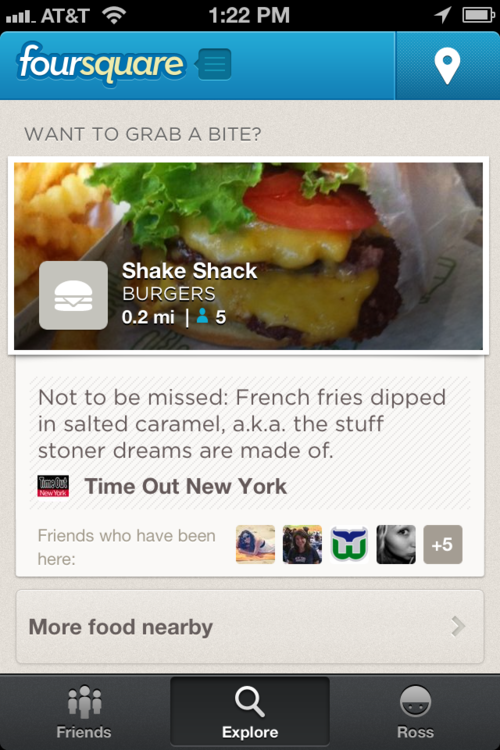 Data that will surely be incorporated in Foursquare’s “Explore” recommendation engine.